It wasn’t just knowing the case forward and back. It was also about developing a character that was credible on the witness stand. The case members of Missouri Southern State University’s Mock Trial team prepared for during the 2017-18 season involved attempted murder, with a drug angle to it. Witnesses included the victim’s daughter, a pharmacologist, an Uber driver and others. Team members must be ready to serve as both the prosecution and defense during tournaments. In competition, it’s the details that matter when taking the witness stand, says the Missouri Southern sophomore from Carthage – who took the stand as the attempted murder victim. Sanchez, a sophomore working on a double major in Spanish and political science, says she plans to study immigration law after graduation. While Missouri Southern’s team did not advance onward from the regional tournament, the season was very successful according to Dr. Nicholas Nicoletti, the team’s head coach. What was especially remarkable about their success was the number of first-year participants on the team, including Sanchez. 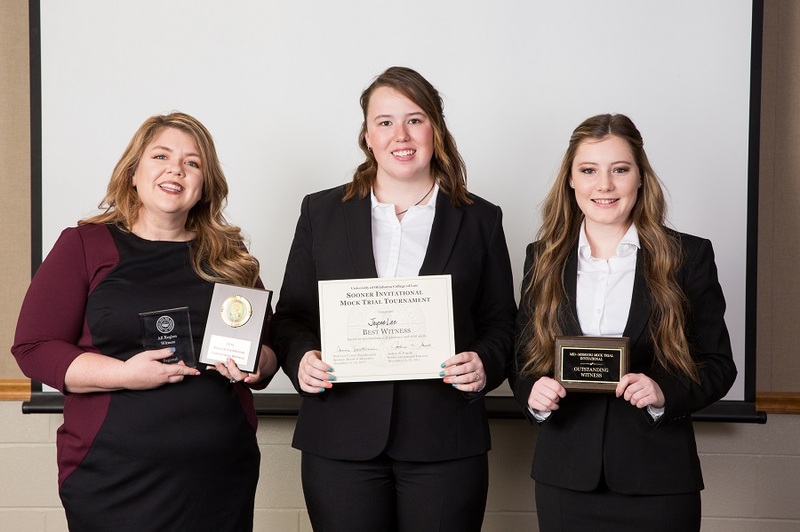 Sarah Schultz, a sophomore business management major from Baxter Springs, Kan., received an Outstanding Witness Award during the Mid-Missouri Mock Trial Tournament held in January at the University of Missouri. Jaycee Lee, a senior criminal justice administration major from Aurora, Mo., was also recognized as an Outstanding Witness during the Sooner Invitational at the University of Oklahoma in November 2017.